When you create a DotNetNuke module that needs to connect to the database, you have the option of coding the data access methods manually or leveraging the DotNetNuke framework. To allow DotNetNuke (and it's modules) to communicate with any data source. However, unlike the DAL, the DAL+ is not 100% portable to other data sources. For example, if a module is developed using the DAL+ that retrieves data using one stored procedure, an alternate database must be able to perform the exact same functionality using only one stored procedure. In some cases this is not possible due to differences in databases. However, in those instances where you will not need to run your module on alternate databases (for example for internal development) it is recommended that you use the DAL+. The code savings is significant. The DAL does require that you code a Abstract Provider and one or more custom Concrete Providers. This allows you to create modules that are 100% portable to other databases. The Abstract Provider reads the settings in the web.config file to determine what the currently configured database is and exposes data access methods. In the example below the method is GetSurveys which is declared MustOverride. 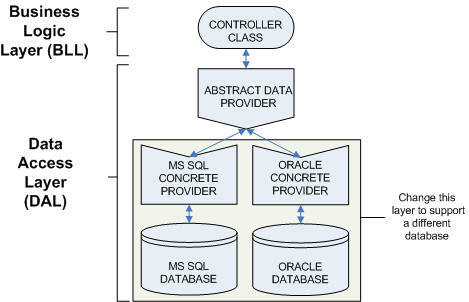 The Concrete Provider overrides the methods in the Abstract Provider and performs the data access task. The Controller Class uses DataProvider.Instance() to call methods in the Abstract Provider which calls the corresponding overridden methods in the Concrete Provider. Using the DAL+ allows a module developer to write less code to access the database than they would if they did not use the DotNetNuke framework. The DAL+ has it's limitations and the DAL is provided in those cases where 100% portability is required.